(CNN) -- "Pain is weakness leaving the body." 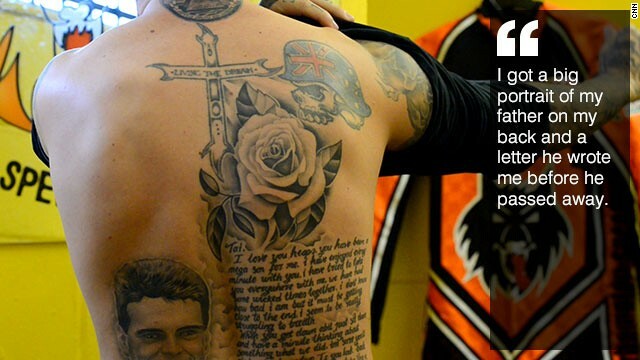 It's written large in ink on his upper torso, and, at the age of just 23, Tai Woffinden knows all about pain -- and the strength needed to overcome it. 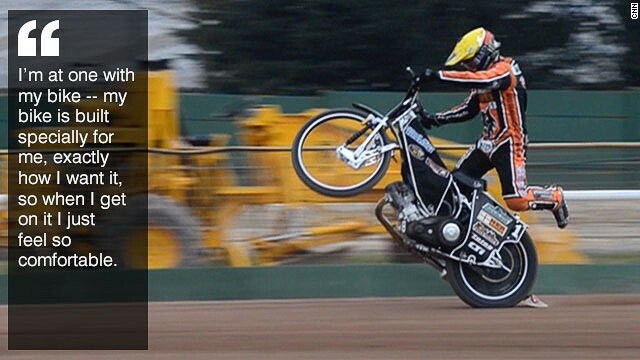 As a speedway rider he has broken virtually every bone on the way to becoming world champion in what is surely one of the most visceral types of racing -- hurtling around a gravel track on a motorbike with no gears and no brakes. And on his skin you can see how just he has embraced the hurt that life brings. 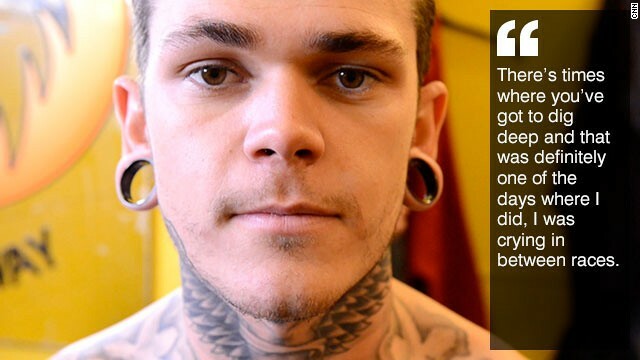 "They say your body's a temple, so why not decorate the walls," says Woffinden, who looks like any alternative skater kid with his backwards cap, skinny black jeans and gaping gauge earrings. "I just enjoy pain, I guess. I like the art," he tells CNN's Human to Hero series. 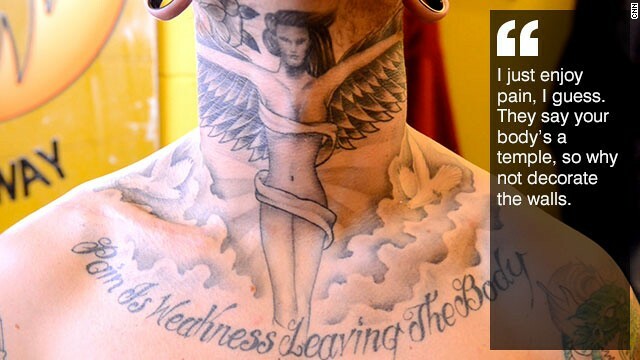 His arms, hands, face, neck and shoulders are all adorned with tattoos, including the aforementioned quote about the departure of pain -- popularly attributed to a U.S. Marine Corps general -- emblazoned below his battered collarbone. His fingers bear the acronym "DILLIGAF" -- the calling card for rebellious teens across the Western world. But most revealing is the design on his back -- a portrait of his father and racing mentor, and one of the letters he wrote to his son before passing away in 2010. "I have tried to take you everywhere with me. We have had some wicked times together," it reads, above the epitaph "In God's Hands." 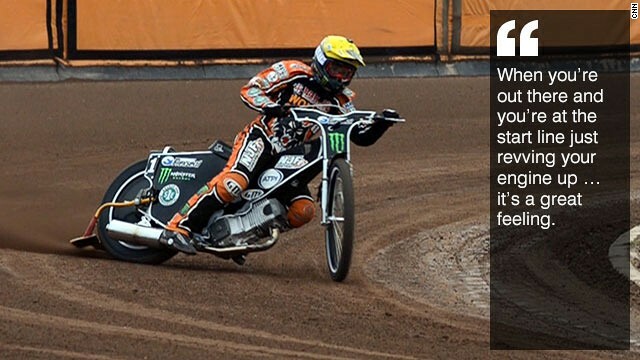 Rob Woffinden, himself a former speedway rider, did not live to see his 50th birthday. Nor did he see Tai fulfill his great promise last year, when he became the youngest world champion in the modern Grand Prix era. But his legacy lives on, and he will not be forgotten. Following his retirement as a racer, he took the Woffinden family from the industrial English town of Scunthorpe to Australia. 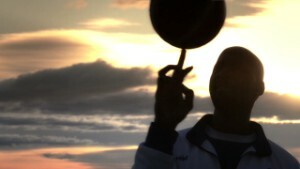 "It was purely just to give me a better upbringing," says Tai, in his distinctly Australian accent. "I think it was a great decision that they made. But, you know, it's good to be back here and doing what I love." It was in Perth where he took up speedway riding at the age of 12, having first got into motocross -- thrilling off-road racing that still has him hooked today. "He didn't know if he wanted me to get into it, but we went ahead with it and I kept progressing and progressing, and when I was 15 and a half we made the decision to come back to Europe and show everybody how I ride," Tai says. "We kind of left our whole life in Australia, we just stopped everything -- I mean, my dad was selling cars on a car yard." Another trophy for Tai's cabinet! Thanks @BTSP "@FloBTSP: Check out these trophies @TWoffinden - very impressive! 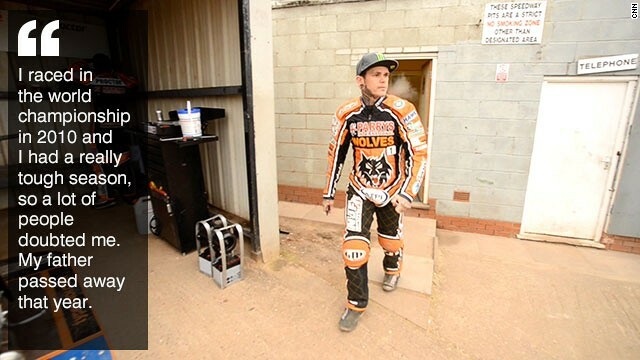 pic.twitter.com/URy6Tp1eLi"
Quickly making his mark as a teen prodigy, Woffinden rose up the ranks, breaking records on the way. 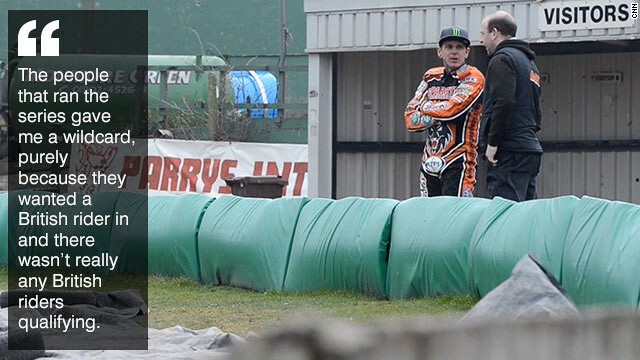 "My progression over the last eight years has been pretty crazy, really," he says, at the home stadium of his British team Wolverhampton. Thick English fog rolls in over the concrete terraces, still strewn with remnants of a preseason exhibition for fans the previous night. The bleak surroundings are a far cry from the blue skies Down Under -- bike engines roar from the pits as the mechanics get ready for training, while groundstaff smooth out the stoney circuit. 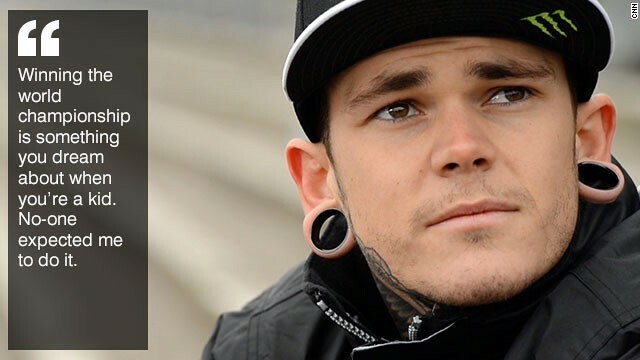 "There's only one year when I plateaued off," Woffinden continues, "but apart from that, it was just upwards, upwards, upwards. 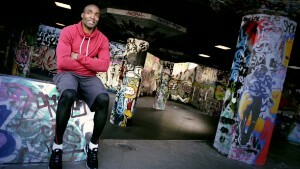 I just kept going and going, every challenge that came in front of me, I conquered it." That "plateau" came when his father succumbed to an inoperable tumor. "I had a really tough season, so a lot of people doubted me," he says. "My father passed away that year and I had a lot of problems in the team." 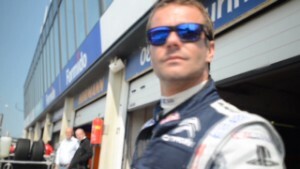 But his fortunes changed last year, when he was again given a wildcard entry into the Grand Prix series. "The people that ran the series wanted a British rider in and there wasn't really any British riders qualifying -- it gave me the opportunity," he explains. "At the start of the year I was 500-to-1 at the bookies. We were just aiming for a top-eight finish to secure me a spot for next year, because I didn't really want to be one of those riders that gets a wildcard every year." 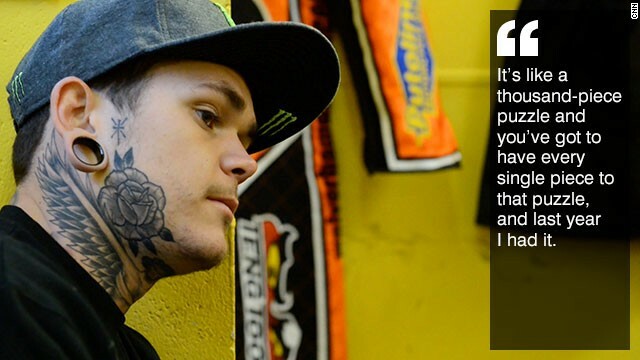 Woffinden set his sights higher after an impressive start before breaking his collarbone in his home British GP. He returned to action just two weeks later, but broke it again in the penultimate round with the title in sight. "There's times where you've got to dig deep and that was definitely one of the days where I did -- I was crying in between races," he recalls of the series, which involved 11 meetings across Europe after the opener in New Zealand. "But I got another seven points and that was crucial going into the last round, and I clinched the championship in my second race. "When I saw him, the weight just came off and it was an amazing feeling." 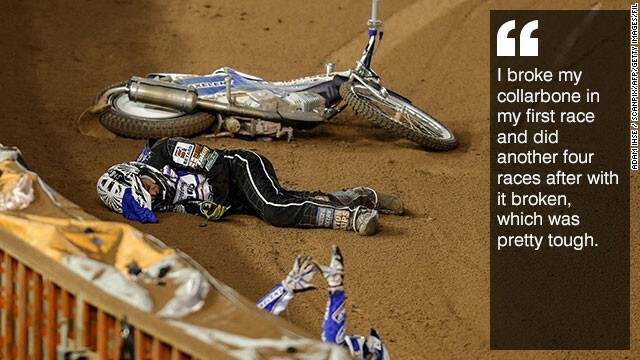 That success has moved him up into the big league of the speedway world. 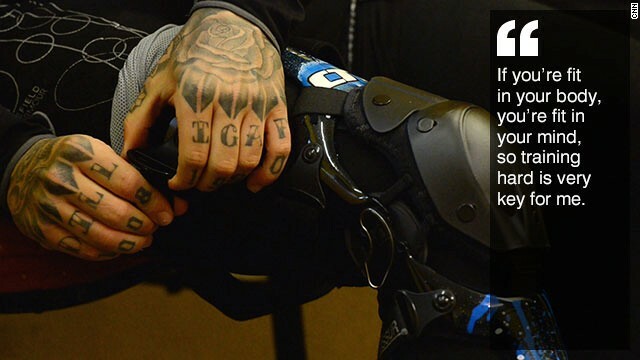 His protective suit is covered in sponsors' logos and he is in big demand -- as well as Wolverhampton, Woffinden will also ride for clubs in Poland and Sweden, plus the Grand Prix circuit. It means he's training, racing and traveling seven days a week, and he couldn't be happier. "Across Europe it's pretty big. You know, Poland they get 20-25,000 just to a league meeting. 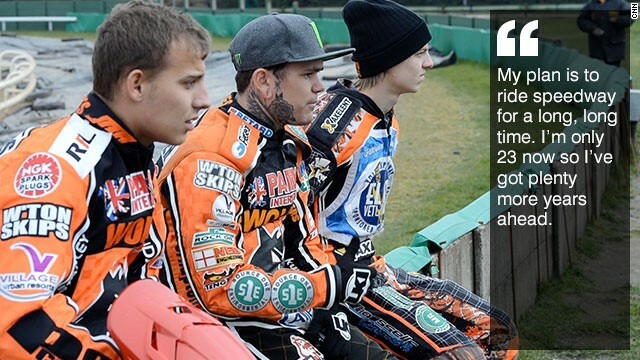 Sweden's pretty busy as well," Woffinden says. "I ride Poland on a Sunday, England on a Monday and Sweden on a Tuesday. I can do Germany on a Wednesday or Denmark or Czech Republic on a Wednesday if I wanted to, but you can do too much." 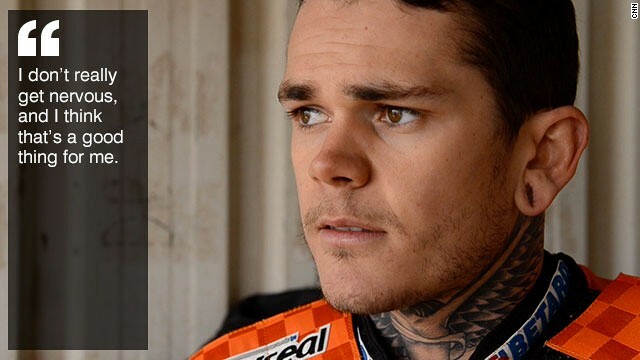 Despite his Australian upbringing, Woffinden has been named captain of Britain's Grand Prix team this season, which kicked off domestically this month. "I'm definitely more British. I was born here and I ride for my country, but Australia is always going to be home for me, I go there every winter in the offseason," he says. The challenge now is to retain his world title, something that only two riders have done in the past 20 years. "I did everything I could to make it happen. 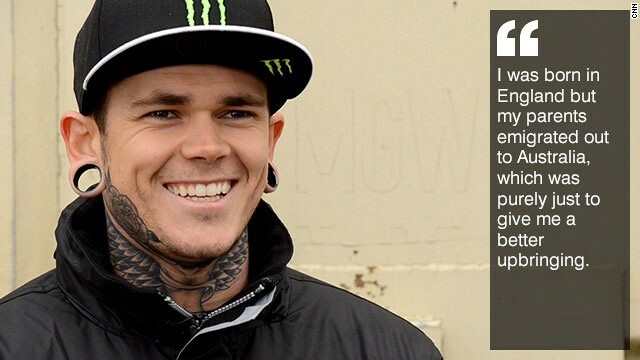 I was training hard, I was eating properly, I had the best bikes I could have, the best engines, a good team around me -- even down to my mum and my girlfriend booking flights and keeping all the logistics," Woffinden says. "It's like a thousand-piece puzzle and you've got to have every single piece to that puzzle. Last year I had it and hopefully this year I'll have it as well." For someone of his age, he has a great awareness of his responsibilities -- to his teammates, his fans and his sponsors -- but when it comes down to it, he's still a kid going full throttle. "Nothing comes close to it, except maybe skydiving. 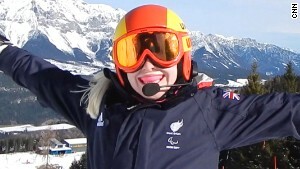 When you're at the start line just revving your engine up, and you've got the other boys on the inside of you and everyone wants to be there first ... going down the back-straight and you've got somebody inches away from you and your elbows are rubbing and you've got to get it into next corner ... it's just a great feeling." And it makes all the pain worthwhile.